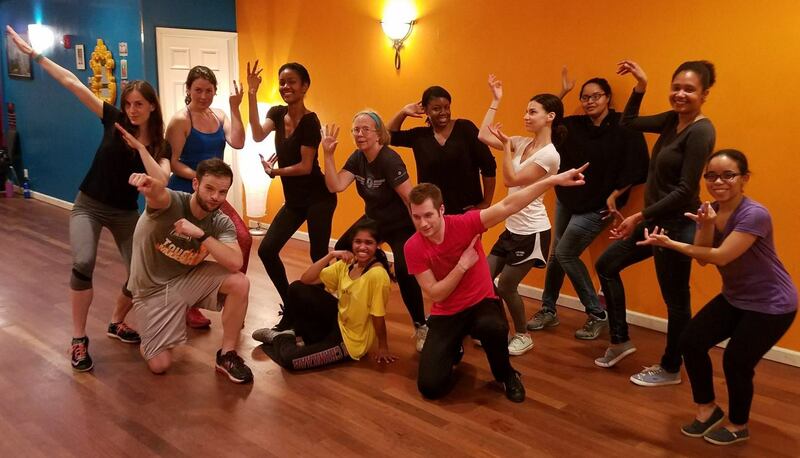 Philly residents Teena Varghese, 27, and Deeksha Seth, 34, have joined forces to bring the high energy and upbeat workout of BollyX to Philly Dance Fitness. By day, Teena works as a lab researcher for an area pharma company and Deeksha juggles completing her PhD in mechanical engineering and raising a 3-month-old baby boy with her husband Jacky, also a BollyX instructor! By night, these two dancers break it down to Bollywood’s greatest hits. Read on to learn how they combine different Indian dance styles with a high intensity workout format and how you, too, can get involved. Philly Dance Fitness: Tell us a little about your background in dance. 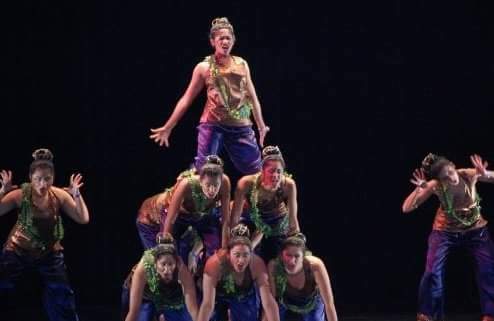 Teena competing with her dance team, Chankaar, at Boston University. Teena Varghese: Growing up, I always wanted to take Indian classical dance classes but I lived in the suburbs of New York and everything was far away. In high school, I found out there was a North Indian dance class called Kathak at a local ashram so I started taking classes there. When I got to Boston University, I joined an all-girls fusion dance team, Chankaar. That’s when I really got used to being strict and specific with my dance moves. They were very competitive. We would practice three times a week. During competition weeks, we would meet every night! It was pretty intense and I was only able to compete for two semesters. I eventually found out about a local Indian classical dance school and danced there for the rest of my time in Boston. 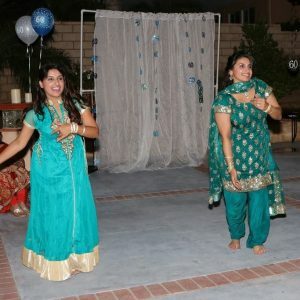 Deeksha (right) performing at a family function. Deeksha Seth: I actually have no formal dance training. But, I have a huge family and we all lived six blocks from each other in India. 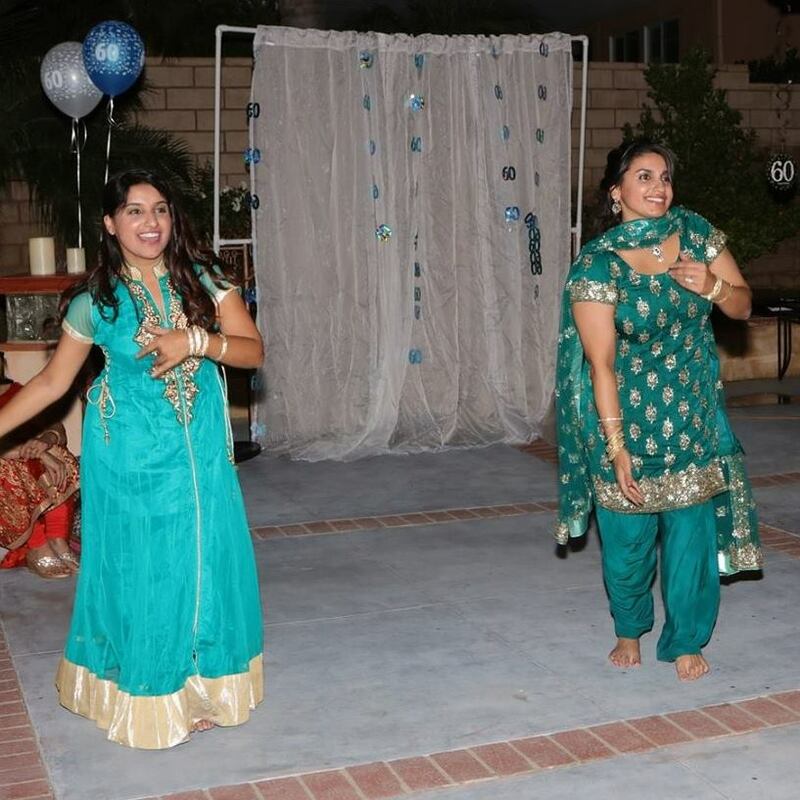 Anytime someone would come over, my dad would say, “Dance, Deeksha!” I would get up and start dancing like, “Sure, what do I know?” I ended up dancing a lot in school shows and at family functions since dance is a really big component of Indian weddings and parties. When I moved to California for college at Cal Poly Pomona, I wanted to join a Bhangra team, but the school didn’t have one. I thought, “How could you not have one? !” Through a mutual friend, I met a guy named Jacky who also really wanted to dance Bhangra, so we decided to create our own team. Deeksha and (now husband) Jacky at a Bhangra performance in Los Angeles in 2005. 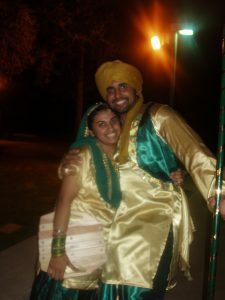 The first year we only did Bhangra. After that I choreographed an old Hindi song, and the next year I got really into the Indian version of Dancing with the Stars because it had waltz and cha-cha to Indian music and I wanted to do that. Jacky and I danced together for years and then went our separate ways after college. After a few years we reconnected and ended up getting married — dance really did bring us together! How did you get into teaching BollyX? Deeksha: I moved to Philly for my PhD and completely dropped the ball. I wasn’t working out or dancing. But one of my friends in Chicago is friends with one of the three co-founders of BollyX, and she told me about their new workout format. I looked it up but there were no classes near me, so I decided to go to New York for a day to get trained. Teena (center in yellow) teaching a Philly Dance Fitness BollyX class. Teena: Some of my friends from Chankaar started teaching BollyX in Boston and New York so I decided that I would look into it since it’s a good way to motivate myself to workout and stay fit. Unlike Deeksha, I trained mostly online. Learning to pre-cue each step to help show students what the next move would be was the hardest part. As you train, you learn pre-set choreo and then you get to choose what routines you want to use in class as long as it follows a high interval training format. The training process can be different for everyone and it’s cool to see how people in different countries do it. I forget whether it was Japan or Toronto but I saw someone recently dressed up as a giant Pikachu teaching a BollyX class. Why do you like BollyX? Teena: It’s very accessible. I’ve been to Bollywood technique classes and even with a decent background in dance it can take me a minute to pick everything up. Technique instructors also often build off the previous class so it’s more difficult to step right in. BollyX is much more workout- and cardio-oriented. 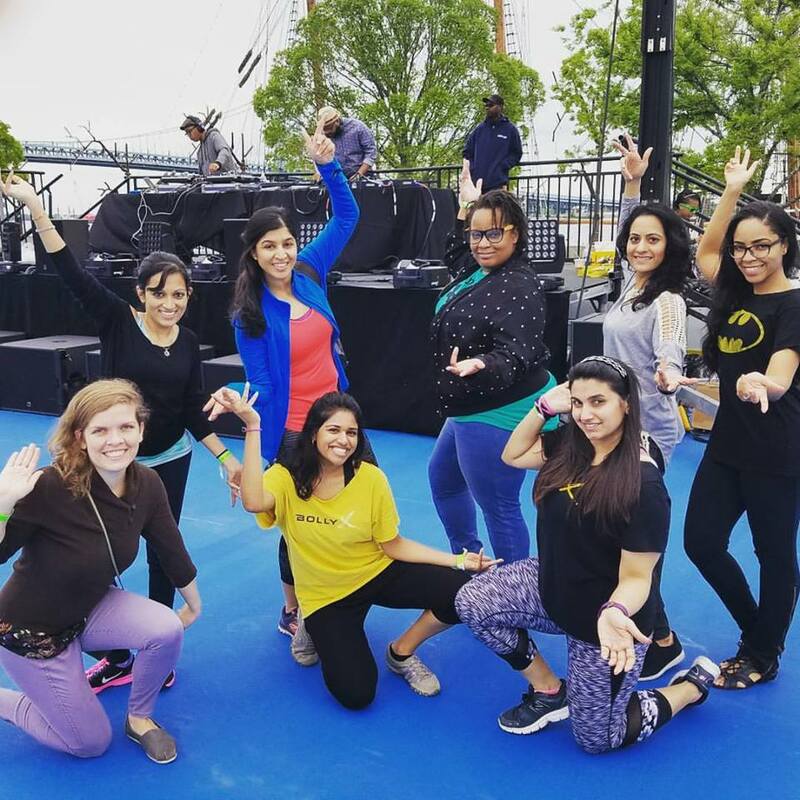 Teena (front in yellow) and Deeksha (next to her in black) after teaching BollyX together. Another thing I really like is the little performance component in it. At the end we do a shorter song twice with the full class; then split into two groups and each side cheers while the other side performs. That element of having others cheering for you — even if they are complete strangers — definitely builds camaraderie in the class. Then at the end, when we all dance together, everyone feels like, “Alright, we can do this; we got this.” I know it sounds really cheesy but it’s definitely a “We’re in this together” attitude. I’ve seen it go a long way. What advice do you have for students considering a Bollywood dance class for the first time? Teena: I know a lot of people feel self-conscious dancing for the first time but in this class you’ll notice that you’re not looking at anyone else! You’re looking at the instructor and yourself, and that’s it. No one cares what you’re doing. Deeksha: There’s no prerequisite or dance experience required. You can control the intensity of the class and be at your own comfort level. If you want to just take it easy and dance, you can, but if you want to push yourself and get a really good workout you can do that, too. It’s really a workout class and we’re just using dance as a tool. So as long as you’re sweating and your heart rate goes up, you’re doing it right. Honestly, just bring water, safe sneakers, and show up! What movie or song would you recommend to someone seeking an introduction to Bollywood? Teena: Kabhi Khushi Kabhi Ghum is great because it has a ton of big time celebrities, spanning different generations, all in the same movie. Any South Asian event you go to, there’s a good chance one of the K3G songs will come on at some point (probably “Bole Chudiyan”). It’s also a great test of stamina — if you can make it through those three hours, then you’re ready for almost any Bollywood movie! And of course, as all Bollywood classics, it’ll make you laugh, cry, and most importantly, dance! Deeksha: “Phir Milenge Chalte Chalte” from the movie Rab Ne Bana Di Jodi because in just one song it takes us through a few decades of Bollywood music videos’ evolution. It doesn’t quite reach the 2000’s but I think it’s a great compilation of moves that represent the different eras of Bollywood. Find out more about BollyX here or just come try it firsthand! Deeksha and Teena alternate teaching at 6:30 p.m. on Tuesdays at our Fairmount studio, 2511 W. Girard Ave. This dynamic duo also will be teaching BollyX to help promote the upcoming Philadelphia Dance Day — first on June 16 at the FringeA-thon fundraising dance marathon, then on the big day itself on July 28.